Kennels - THARFIELD PET BOARDING Ltd.
We pride ourselves on giving your dogs the best care. We Have 22 kennels altogether and all our kennels have their own covered runs attached to the living area with free access during the day. The sleeping quarters have their own individual lighting and heat lamps for the winter months or cold summer evenings. Your dogs are fed up to twice a day (or 3 times for puppies or diet dependant) with either complete food or meat and mixer. We have a variety of feeds but if your dog requires a specific diet that we do not have, we are happy for you to provide this for your pet. If family dogs are sharing a kennel, they can easily be separated for feeding time to ensure both dogs have eaten. We give bedtime biscuits to settle dogs for the night just like you would at home. Fresh water is down at all times. Your dog will have plenty of exercise during their stay. 3 or more off lead runs will be given in one of our paddocks where they will be safe and secure. We provide plastic beds with soft ‘vet bedding’ for comfort. This can be washed and dried quickly for hygiene purposes. 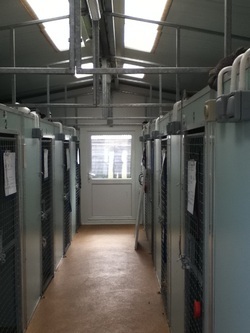 All the kennels are cleaned every day to provide a clean and healthy environment. We are happy to give medications (just as if they are at home and at no extra cost). Heating is on constantly during winter and cold periods at no extra cost.